Description: Warm earth toned Bone Beige and Moccasin Tan stained glass, accented with glistening Root Brown and Sage Green, is used to make this intricate interlocking patterned shade. Mission style hardware in a hand applied Mahogany Bronze finish supports the handsome round cone shade inspired by historic American artwork. 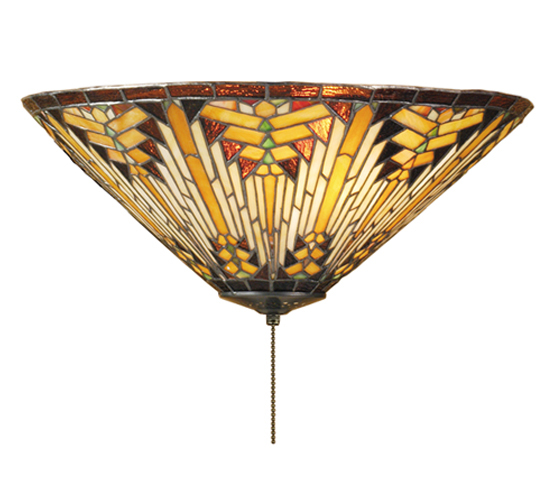 Handcrafted with the copper foil technique developed by Louis Comfort Tiffany, this flush mount fixture is a true masterpiece.